Product #16094 | SKU MBMA-H-S | 0.0 (no ratings yet) Thanks for your rating! 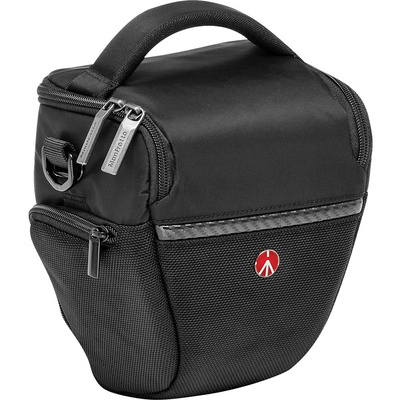 The small, black water-repellent Advanced Holster S from Manfrotto holds a DSLR with an attached kit lens inside the padded main compartment. Additionally, it holds two memory cards inside dual padded slip pockets underneath the front flap. To prevent confusion regarding if the memory cards are empty or full, red organization tabs can be tucked into the pockets after the cards have been used. An exterior zippered pocket on each side of the holster holds small accessories such as filters or chargers. To protect your gear during unpredictable weather, a detachable rain cover is included. Additionally, a detachable shoulder strap, a padded top grip handle, and a rear belt strap provide a variety of comfortable ways to carry the holster.